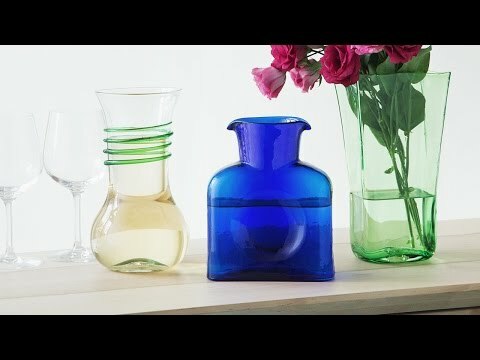 Creating beautiful glass objects is what The Blenko Glass Company has excelled at for over 100 years. 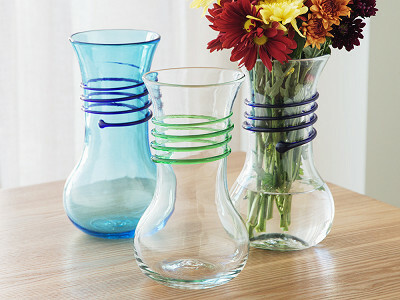 Their double spouted pitcher is hand-blown in America using traditional craftsmanship. The company has been making this unique shape since 1937. 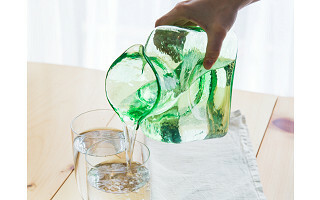 Seen in restaurants and hotels throughout the decades, these brightly colored, decorative glass bottles make an elegant pitcher for water or any beverage you wish. 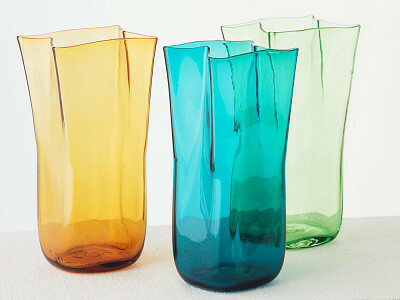 The design—which refracts light—looks lovely as a flower vase or simply a piece of art. The double spout feature is a unique twist on a classic vessel, giving it a symmetrical appeal. 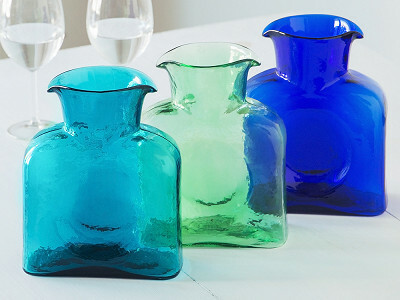 And because each piece is hand-blown, each is one of a kind. Hello everyone! I'm proud to introduce Blenko Glass to The Grommet. I'd be happy to answer any questions you have! I don't see anywhere how much this pitcher holds--does it hold a quart? @Janet 36 fl. oz. If you click on "buy", it is listed there. Thanks, Cindy! Janet, yes, it holds a quart and a quartet of additional ounces! What beautiful pitchers! They look like they'd make wonderful presents for my extended family. They sure would, Christina! Thanks for the kind words! I have a collection of these beautiful vessels. Back in the 60's and 70's when I worked at Fred Waring's famous Shawnee Inn, PA there was one on every table in the beautiful Dogwood Room. Keep up the great craftmanship! thanks Bonnie - Blenko is proud of this timeless design and we appreciate the many many people who have enjoyed it for decades. Just wanted to let everyone know that the pitchers are made in the hometown of Blenko; Milton West Virginia! Hi Jerry, Dean just let me know Blenko is closer to Marshall than WVU......I'm so sorry. Go Thundering Herd, too! I live in Milton, WV, where Blenko Glass is located. I have several pieces I've collected and received as gifts. Their showroom is a sight to behold, if you are ever in the neighborhood. You can tour the factory and watch the craftsmen blow the glass. It's so wonderful to see Blenko launched on The Grommet! We agree, Teresa! Thanks so much for the kind words! 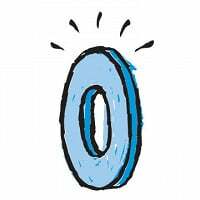 We might have to take a Grommet field trip to check it out. I bought 3 of these about 20 years ago and they are still absolutely beautiful!!! That is so great to hear, Carol! Thanks for the comment! @Kristina when next here at the factory please ask for me and say hello. Blenko fans and collectors are indeed one big family. @Dean I will definitely say hello. So happy to see you guys on Blenko. It made me proud just by association! @Dean Oops, I meant to say that I'm happy to see Blenko on Grommet. Are the pitchers dishwasher safe? Blenko does not recommend washing handmade glass in a dishwasher. Dishwashers will all leave a film on ANY glass or china with repeated use. Some dishwashers use extremely high pressure or exceptionally hot water- for those glass is indeed not a good match. Does that help? I guess my reply is safe- maybe. Recommended No. @ Susan...... 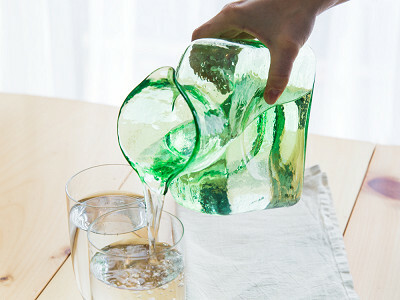 Think of these pieces as beautiful art glass that you can use rather than everyday glassware that looks good. I use mine but the 5 yr old doesn't carry it around. Does that help? Who is the gentleman pictured in the product description? How is the product boxed/wrapped/shipped? Does it come with any information that tells the story of the glass? Each is in a box with bubble wrap and paper, we have utilized this method of packaging for years and it has proven quite successful. There is no information telling the story of our water bottle. Interestingly it was designed in the 1930's for the then relatively new "electric ice boxes." It's shape was specifically made to fit into the narrow shelves in the door. Years have long ago made the door shelf MUCH larger. Our bottle remains unchanged and as popular as ever! My mom fell in love with Blenko Glass in the 1950's! We've always had at least one of your beautiful pieces in our home. I just might have to have this pitcher just to keep up the tradition. Thank you Haze. Your mother had elegant taste in the 1950's! We are confident the water bottle will serve your family well and be enjoyed. @Dean It is so nice to see your far-flung fans showing up here at Grommet. This is rather unusual for our daily launches (since the companies are often quite young) but this gets at the heart of your being a company with a long heritage. I love when a regional treasure like Blenko gets a national embrace from the Grommet community. I'd like to buy one, but am not sure what the color names mean. I want the one pictured above that is green - far left in the video title photo. Is it Sea Breeze, Topaz, or another name? @philip hone I believe the color you are looking at is called Kiwi... My favorite although the hubby loves the Sea Breeze color! Philip -click "buy" (which does not yet at one click commit you) and the selections that then appear are sorted by color. You can select the color you wish more easily then. The green shown is Blenko's KIWI. Lisa- yes, kiwi has more of a mossy tint, less bright. For conversational sake BLENKO has over 1,300 different formulas for making our colors of glass. Thankfully we do not try to make more than 6-10 colors in tableware in any given year! Can you also buy a glass stopper to be able to use it as a decanter? No stoppers made by us would fit this specific shape, the opening is WIDE like a carafe not like a decanter. The opening is approx 4 inches wide at the spout, rather large for a decanter. @Dean and @Bo, you could probably go to a craft store and find a cork that would fit. It would probably take away from the elegance of the glass, but if you're going to use it just in the fridge, or in a very informal setting, that would work. A good craft store will have all sorts of 'stopper' type things. BTW, Dean, these are gorgeous pitchers! I love the design and the colors. Just beautiful! I was interested in this in the Sea Breeze color, but it no longer turns up as one of the options. Have you run out of that color? @Sarah we should have inventory still on the Sea Breeze. We are looking into this now. Please check back a little later. @joanne - We are good to go on Sea Breeze. You should be able to order that color now. @Karen - hang on. We should have some inventory left on the Sea Breeze. We are checking on that. Please check back later. @karen - We corrected the glitch on Sea Breeze. You should be able to order that color now. Is there anyway to date Blenko. I have a piece that was my mothers. It is bright red and so nice at Christmas . Does Blenko still manufacture the Red Pitcher? That's the color I have always wanted but it is hard to find. @Jennifer I do not see any mention of the dimensions of these Blenko pitchers. Can you furnish that, please? Hi Phyllis, the dimensions of Blenko are 6.5" x 8.5" x 2"! Hi Jennifer, not that we are aware of, but if they are made available we will look to bring them on site. Stay tuned!